The IBJJF World Master Jiu-Jitsu Championship (better known as Masters Worlds) is the second biggest tournament of the year, with nearly 4500 competitors. 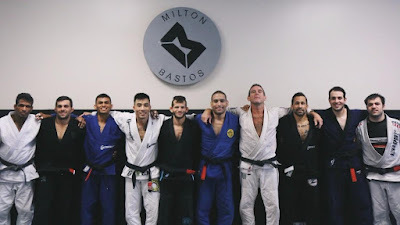 Milton Bastos of Ares Jiu-Jitsu is a regular competitor in the masters’ divisions, and he knows just how tough these tournaments can be. That's why he set up a week-long training camp at his Mountain View academy in the Bay Area, so people could focus all their efforts into one final run toward Masters Worlds. "Our student and competition team is mostly in the masters age group," says Bastos. "We also have many teammates from all over the world that planned to visit us during this time as well. We look at competitions as a time for all of us to push each other to our full potential; we do our best to make the most of it, because these kinds of tournaments are once in a lifetime for some." Bastos explains the focus of the last minute camp, which runs up to just three days before the start of the tournament: "This week is really focused on different interval drills and sparring. We alternate the times of specific scenarios and "worst case" moments." The participants on the camp are training two, sometimes three times a day - all the more impressive when you consider they've all got families and full time jobs.